It's time to cook a simple pasta recipe that's easy to prepare and is delicious too. 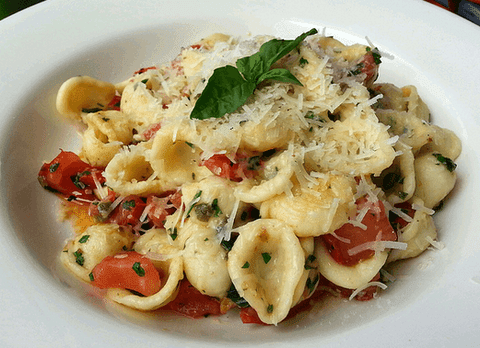 Orecchiette pasta is one of my favorites and is equally loved by my family members and friends. Instead of making a rich, creamy and spicy version, we'll go for a mild yet flavorful serving. Although I've not added broccoli to this recipe, adding a portion of baked or lightly sautéed broccoli is highly recommended. Feel free to slightly increase the quantity of garlic for inducing a strong flavor. If you can get ripe baby cherry tomatoes, the results will be above excellent. I generally prefer to serve pasta with non-alcoholic beverages. Let's get started and quickly make this yummy and fulfilling pasta preparation. Do try this delicious Orecchiette pasta recipe flavored with fresh tomatoes and garlic and completed with green herbs and a sprinkle of Parmesan cheese. Cook pasta in salted boiling water on a medium flame until it turns tender. Drain and keep aside. Heat olive oil in a large nonstick skillet on a medium flame. Add minced garlic and stir fry until it starts to change color. Add chicken broth with pasta. Sprinkle minced oregano and thyme leaves on top and season with salt and a pinch of white pepper powder. Gently stir for 2 to 3 minutes till the broth is reduced and is well coated on the seasoned pasta. Switch off the flame and ladle out in the serving bowls. Garnish with basil sprig and serve hot.